Designed to make full use of an excavator in hard to reach areas, these multi purpose flail heads are able to cut a wide range of materials of all thicknesses. 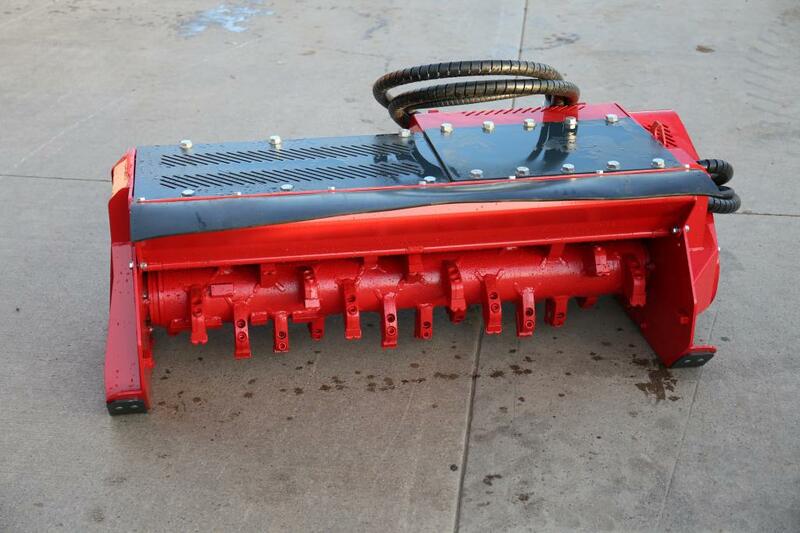 To fit 3,500Kg – 5,500Kg diggers, 80cm cutting head with 2 Y & 1 straight flail, cuts 0 - 4cm material, 250Kg, requires 45 Litres of oil, flow diverter. To fit 3,500Kg – 5,500Kg diggers, 1M cutting head with heavy duty hammer flails, cuts 0 - 4cm material, 275Kg, requires 45 Litres of oil, flow diverter. To fit 5,500Kg – 8,000Kg diggers, 1M cutting head with heavy duty hammer flails, cuts 0 - 5cm material, 415Kg, requires 65 Litres of oil, flow diverter. To fit 12,000Kg – 16,000Kg diggers, 1.4M cutting head with heavy duty fixed carbide tipped hammers, cuts 0 - 15cm material, 815Kg, requires 110 Litres of oil, flow diverter.